There’s no shortage of ways to decorate your home for Halloween, but jack-o’-lanterns, paper skeletons, and cobwebs don’t even come close to being as wonderfully spooky as this Stranger Things Eleven candle holder that actually appears to bleed from the nose—without the need for telekinetic powers. The ceramic candle holder includes a pair of blood red candles that can be placed in Eleven’s head, and as they burn and melt, hot wax will drip out of both of her nostrils. 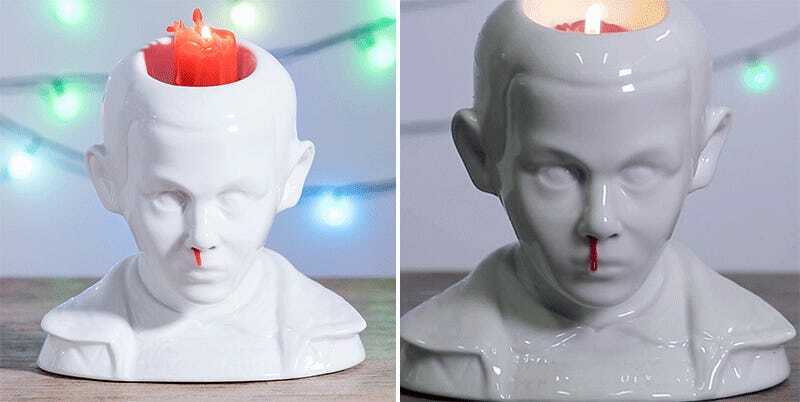 Available now for pre-order for $40, the candle holder also includes a special tool for removing waxy build-ups inside Eleven’s nasal cavity, but nothing to catch the actual nose bleeds as they drip out. So you’ll probably want to stick a couple of Eggo waffles under there to protect your furniture.